Gerald Clayton is one of the most talked about young pianists working today. Clayton is the 27-year-old son of jazz bassist/bandleader/producer John Clayton. In just a few short years on the jazz scene Gerald Clayton has drawn raves from all segments of the jazz world and has attracted an audience that includes hip-hoppers; be-boppers; avant-garde lovers and every hyphenate in between. Clayton began his piano studies at age seven. His teachers have included famed pianists Kenny Barron and Billy Childs. In 2006, he finished second in the prestigious Thelonious Monk Institute of Jazz Piano Competition. He made his bones in the groups fronted by his dad and uncle – The Clayton Brothers and the Clayton/Hamilton Jazz Orchestra. He has also backed a number of well-known singers; including Diana Krall, Michael Buble and Roberta Gambarini. He has also written arrangements and played piano on the most recent albums by trumpet master Roy Hargrove (Emergence) and rising trumpet star Ambrose Akinmusire (When the Heart Emerges Glistening). In 2009, Gerald Clayton made his debut recording as a leader; Two-Shade. It earned a Grammy for “Best Improvised Jazz Solo” for his version of Cole Porter’s “All of You”. 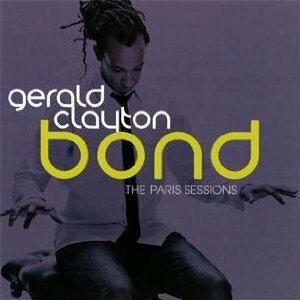 Earlier this month, he released his second album, another trio date: Bond – The Paris Sessions. More Grammy noms may follow for this disc, as it includes many dynamite originals plus interesting reworkings of jazz and popular standards. The Gerald Clayton Trio will appear at the 2011 Atlanta Jazz Festival, this Sunday May 29th, at 7 p.m. I’ll be checking them out. I hope you will too. This entry was posted on May 27, 2011 at 8:40 pm and is filed under Atlanta Jazz Festival 2011, JazzLives!, The Jazz Continues... with tags atlanta jazz festival, gerald clayton, jazz, roy hargrove, the clayton brothers, the clayton-hamilton jazz orchestra. You can follow any responses to this entry through the RSS 2.0 feed. You can leave a response, or trackback from your own site.